When i started writing this post, i felt odd since I generally focus on posting about more fancy items. For the last few months i been in the health mode and I have started exploring new vegetables (stuff that i haven’t tried before) and incorporating them in my daily diet. Manathakkali keerai is one of them. While i believe that this vegetable is an acquired taste, i do strongly feel one should incorporate it in ones diet for the benefits it offers. 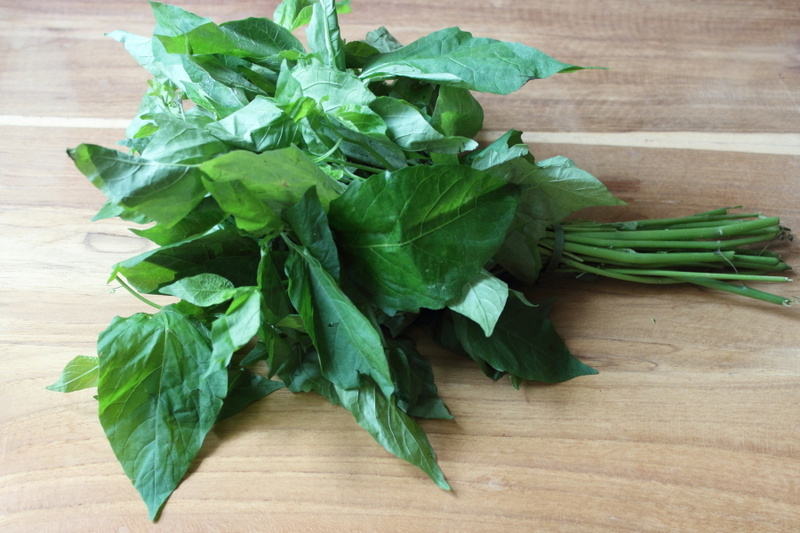 Manathakkali Keerai as its known in tamil, is also known as the black nightshade (Kamanchi Chettu in Telugu, Makoy in Hindi, Kakkesappu in Kannada). They are bitter in taste but are full of nutrition. When cooked properly, the bitter taste can be masked. It is effective in treating all kinds of ulcers (stomach as well as mouth). Manathakkali keerai is alkaline in nature. Hence it is good for treating acidity (which can be controlled by maintaining a proper ratio between acidic and alkaline food). It is good to have this variety of greens at least once a week. Before i go into the recipe, a little bit of trivia about greens 1) avoid greens with dark leaves as they may be contaminated with metals 2) avoid leaves infested with worms 3)avoid consuming greens at night since it can lead to gastric inconveniences. 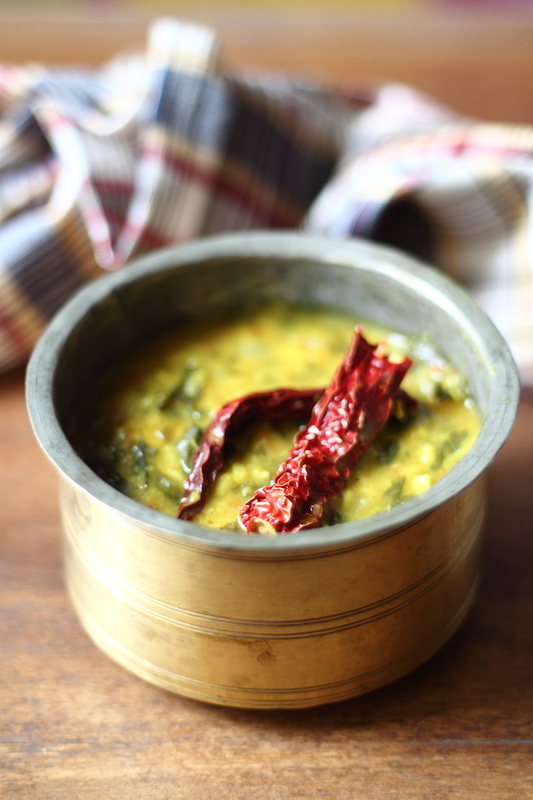 Healthy and Nutritious south indian gravy! 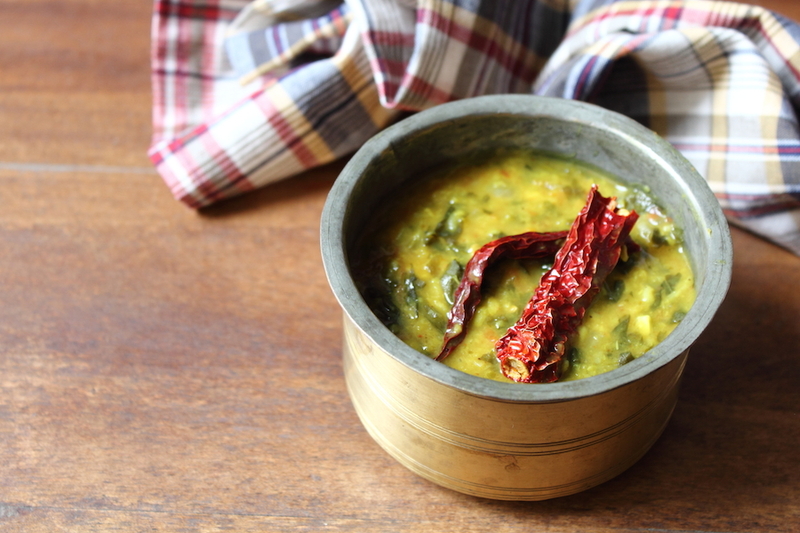 Wash and clean the moong dal. Put it in a pressure cooker along with the onions, tomatoes, garlic, chilli powder, turmeric powder, salt and water. Pressure cook it for 10 minutes on medium flame. I pressure cooked it for 2 whistles. Take it off the stove. Once the steam is released fully from the cooker, open it and stir the gravy. Place it on low heat and add the tamarind paste and boil well. Take a separate pan for tempering the dish. Heat the oil. Add the red chillies. Once it changes colour, add the asafoetida and pour it onto the boiling gravy. Adjust the level of the tamarind depending on how concentrated your tamarind paste is. Start with half a teaspoon and increase it till it reaches your comfort level. Increase spice level to taste.